This recipe was given to me by a long time friend, back in our "newly married-let's have a tea party" days. I've made it for baby showers, wedding showers, and plenty of breakfast and brunch occasions. I have included some flavor variations at the end, but the original cranberry white chocolate version is the one I'm sharing here. Preheat oven to 375. Lightly grease a cookie sheet. Put dry ingredients into a bowl or the bowl of a food processor. Stir briefly to combine. Using the food processor or two knives, cut in the the 6 Tbsp. of butter. Pulse or chop until mixture forms coarse crumbs. If using a food processor, move the mixture into a mixing bowl. Gently stir in buttermilk, egg, and vanilla. Only mix until combined. Sometimes I have to add a bit of extra buttermilk at this point (about 1 Tbsp. or so). Fold in cranberries and white chocolate chips. Scoop scones onto prepared baking sheet--I use my standard sized cookie scoop and end up with about 2 dozen scones. Bake at 375 for 8-10 minutes, or just until scones become firm and begin to turn golden around the edges. 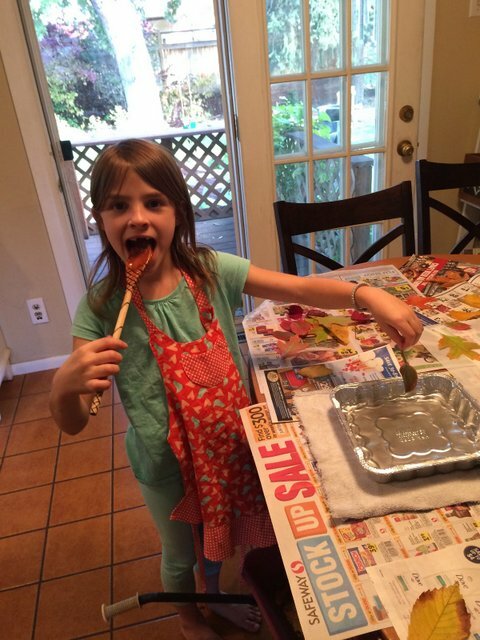 Katya’s favorite fall treat has now been made 4 times this season! It turns out that these cider caramels are pretty popular, and the more we hand out as gifts the more requests we get. Katya helped me make the first batch, learning a lot about both the waiting and the rushing that goes into home candy making. Katya left the cooking of subsequent batches up to me, but both she and Nathan had a wonderful time handing out these delectable treats to teachers and friends. Yum! These delicious homemade caramels have a slight spiced cider flavor that makes them particularly special. The temperature of candy making is always a bit tricky, but even if they turn out harder than desired they can be broken apart with a mallet and enjoyed just the same. Pour cider into a medium saucepan and boil on high for 15-20 minutes or until cider is reduced to 1/3 cup. Keep an eye on it--it goes from thick to burned pretty fast! Line an 8 inch square pan with parchment paper. Coat with a bit of cooking spray or rub with the butter wrapper to grease. Set aside. While the cider is boiling, get out a second saucepan. Pour 1/3 cup whipping cream into a glass measuring cup. Add enough water to make 1/2 cup. Pour that into the empty saucepan. Add sugar and corn syrup. Cook over low heat until the sugar dissolves. Insert candy thermometer and simmer until the syrup reaches 234 degrees. (At my altitude, it is actually 222 degrees). While sugar mixture heats, keep pouring the apple cider into a clean glass measuring cup until it is only 1/3 cup. When it has reduced enough, pour it into that measuring cup and let it cool. While it cools, stir in remaining 2/3 cup cream, cinnamon, nutmeg, and allspice. Mix well. When the sugar mixture has reached temperature, remove it from heat and slowly whisk in the cider cream mixture. Add the cubed butter and stir until everything is melted and mixed. Return the pan to low heat and re-insert the candy thermometer. Cook, stirring frequently, until the temperature reaches 248 degrees (236 degrees at my altitude). This part can take a really long time--sometimes 20 minutes or more! Remove the mixture from the heat and pour into the prepared pan. Careful, it is a bit tricky to pour! Let the caramels cool completely at room temperature. It takes several hours, so try just leaving it overnight. Hopefully the caramels are soft enough that you can use kitchen shears to cut them into long strips, and then cut them into 1/2 inch squares. You can try to individually wrap them in squares of waxed paper, or put them into mini muffin papers which is much easier! Sometimes my caramels set up unusually hard, and I have to break them into bite-sized pieces with a kitchen mallet. Sometimes they are a bit soft and when I put them in the mini muffin papers they gradually take on the shape of their container. Either way, they taste good and are totally worth the work! 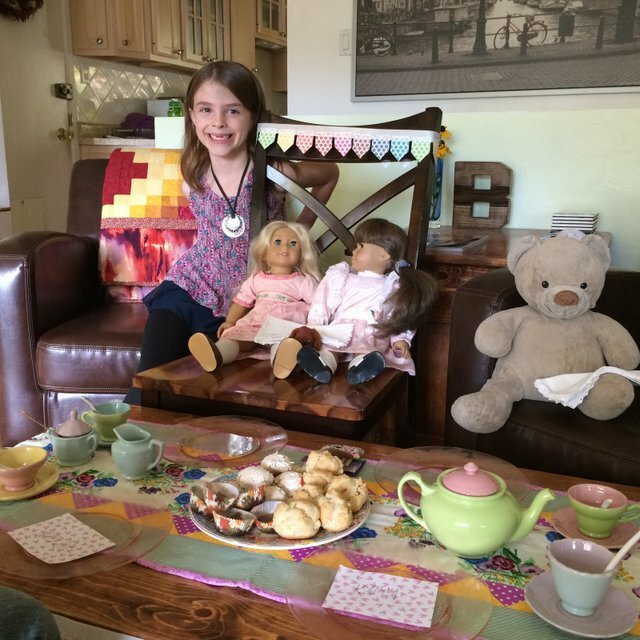 If you decide to host a tea party for an American Girl doll’s birthday, you need to make cream puffs. If you make cream puffs you will have to use several egg yolks for the perfect pastry cream. If you use egg yolks for the pastry cream, you will have egg whites left over. If you have egg whites left over, you will need to make meringue cookies. If you make meringue cookies, you will want to try a new kind. If you try a new kind of meringue cookies, someone will ask you for the recipe. If someone asks you for the recipe, you better post it on the blog. And all that from a little doll’s tea party! These meringue cookies are super sweet and satisfyingly nutty. They are more on the chewy side rather than the crunchy side, a good thing for many (even though it disappointed Nathan!) They give good praline flavor without the need to actually crystallize the pecans. Preheat the oven to 325. Line two large baking sheets with parchment paper or foil. In the bowl of a food processor, place the pecans and pulse 3-5 times until the pecans are coarsely chopped. Add the flour, 1/3 cup of the brown sugar, and the salt. Pulse once or twice more to combine. In the bowl of an electric mixer, beat the egg whites and cream of tartar until frothy and opaque. Increase the mixer speed and beat until whites begin to form soft peaks. Gradually beat in the white sugar until the whites form glossy peaks. Gradually beat in the remaining 1/3 cup brown sugar and the vanilla. Continue beating until the meringue is stiff and smooth when rubbed between the fingers. Lightly fold the pecan mixture into the meringue mixture just until evenly incorporated. Don't mix too much or the meringue will deflate. Use a small cookie scoop or two spoons to drop the mixture onto the prepared baking sheets by heaping tablespoonfuls. Space about 1 inch apart. Bake all the cookies at the same time. Bake for about 10-12 minutes if you want chewier meringues, or rotate the sheets at 10 minutes and bake an additional 10 minutes (total of 18-20 minutes) for crunchier cookies. Cookies are done when they are lightly colored all over. Let cookies cool completely on parchment or foil before attempting to remove. Store in an airtight container for up to 1 week or freeze for up to 1 month. This recipe came from The All-American Cookie Book by Nancy Baggett. I got this recipe at a cookie exchange. (Thanks, SL!) It makes rich, sweet, pretty layered bars that are always a hit. They also keep well, so they are nice for making ahead. Preheat oven to 350 degrees. Spray a 9x13 pan with cooking spray. In a mixer bowl, combine first 6 ingredients (2 cups flour, oats, brown sugar, butter, baking soda, and salt). Dump half of the oat/flour mixture into the prepared pan. Press to create a bottom crust with no holes. If needed, use a bit more than half the mixture to make sure the pan is well covered. Bake bottom crust at 350 degrees for 10 minutes. Mix the remaining 6 Tbsp. flour into the caramel ice cream topping. Stir until evenly combined. Chop nuts. When the partially baked crust comes out of the oven, sprinkle evenly with chocolate chips. Then sprinkle nuts on top. Pour caramel/flour mixture evenly over that. Finally, crumble the remaining flour/oat mixture on top to form a final layer. Return pan to the hot oven and bake an additional 30-40 minutes. The caramel should be hot and bubbly and the oatmeal topping lightly brown. Allow bars to cool thoroughly before cutting. Sometimes the edges are hard to get off of the pan, but you can pick them off for nibbling after you have cut the rest of the bars out of the middle! Store in the refrigerator for best results. Decadent combination of layers with a good texture variety. I can eat way too many of these! Preheat oven to 350. Line an 8x8 pan with foil and spray with nonstick spray. Set aside. In a large bowl, whisk together melted butter and cocoa powder until smooth. Add sugar and whisk until blended. Whisk in eggs and vanilla. Stir in flour until no streaks remain, then fold in hot fudge. Spread in prepared pan and bake for about 20 minutes, until puffy and a toothpick inserted in center comes out with moist crumbs, but no raw batter. Immediately upon removing brownies from oven, top evenly with mini marshmallows. Pop back in the oven for a few minutes, just until marshmallows are puffy but not browned. Let cool for about 30 minutes. 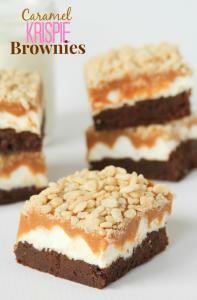 In a microwave safe bowl, heat caramels and 2 TBS water in the microwave, stopping to stir every 30 seconds until smooth. Carefully pour over the marshmallow brownies, spreading gently to cover. Immediately sprinkle with krispies, pressing in gently. Let brownies cool completely before cutting and serving. Click here for a random recipe from my collection!